East gate of the Fort, Jaunpur. bl.uk > Online Gallery Home	> Online exhibitions	> Asia, Pacific and Africa Collections	> East gate of the Fort, Jaunpur. 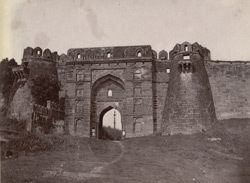 Photograph of the East gate of the Fort in Jaunpur, Uttar Pradesh, from the Archaeological Survey of India Collections, taken by a 'Native photographer for Mr Burgess' in c.1888. The fort was built in the 1360s by Firuz Shah Tughluq (r.1351-1388). This is a view of the East gateway which is all that remains of the fort. Traces of the original blue and yellow glazed brick decoration on the gate are still visible. A nine metre high ceremonial lat, or column, can be viewed through the gateway. The photograph is reproduced as a photogravure in A. Führer and E.W. Smith, 'The Sharqi architecture of Jaunpur' (Calcutta, 1889), pl. ii.